After waiting in line for about three hours outside the Beast Mode Store in downtown Seattle, in the rain and cold, with my one and a half year old and (at the last minute) my wife, I met Marshawn Lynch at a signing event. Even sitting down, he looked bigger in person than on TV. It wasn’t much of an interaction with one of my all-time favorite football players, but he did say, “What’s going on?” and signed items for all three of us. Thanks man. I said “Go Bears!” and he said “Yeah man, Go Bears”. Pretty cool! Author vbsportscardsPosted on January 23, 2018 January 23, 2018 Categories FootballLeave a comment on Beast Mode! 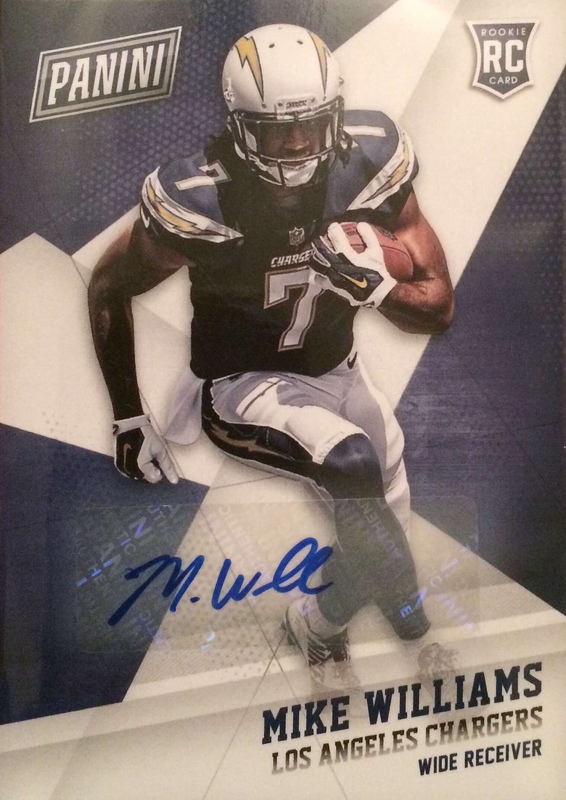 The first card I pulled was a Mike Williams auto RC! Very cool. After that I’m not sure of the order. Here are the other ones. 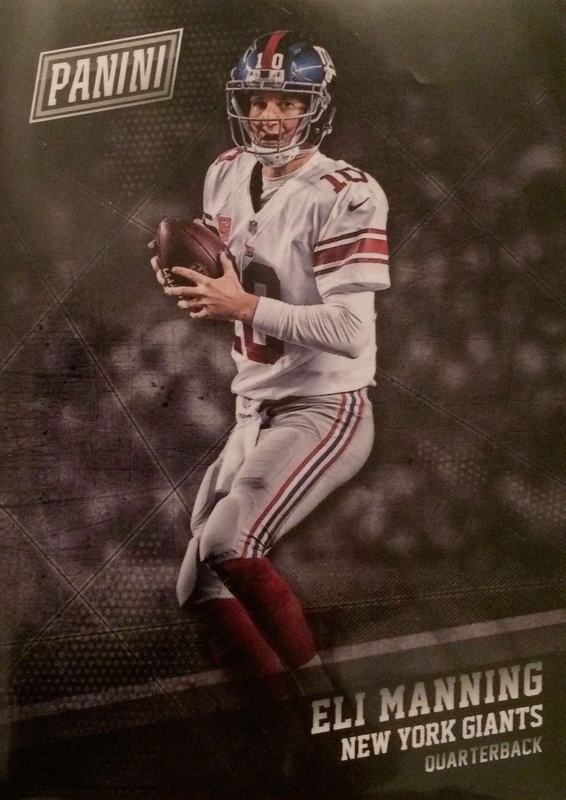 Eli Manning base card (got him last year too). 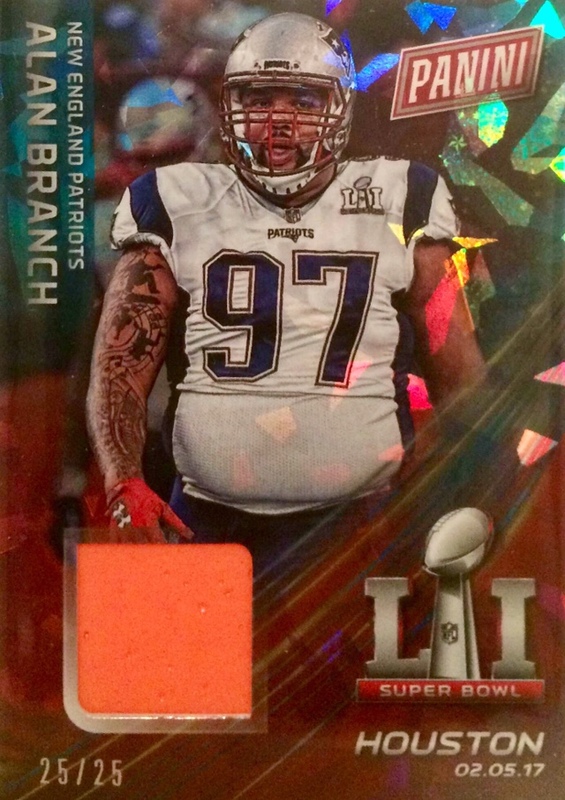 Allen Branch relic from Super Bowl LI #25 /25. At first, I was wondering if this was some kind of Pro Bowl thing with the neon orange, but it’s game used from Super Bowl LI in Houston. (Thank goodness it’s not from SB XLIX in Glendale!!!!!) The material is a spongy and has some vesicles. I wonder if it’s from one of the pylons or yard markers, something like that. Very very cool!!! OBJ. Got him last year too. In this picture, he’s practicing some field goal kicking tricks before a game with the Eagles. Would be nice if this guy could stay healthy and composed, he’s such a good player. 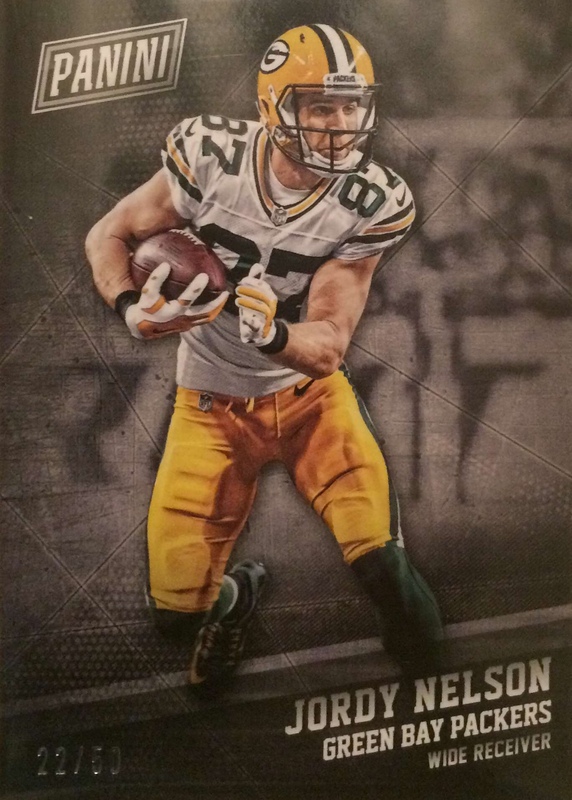 Jordy Nelson parallel on thicker stock, #22 /50. 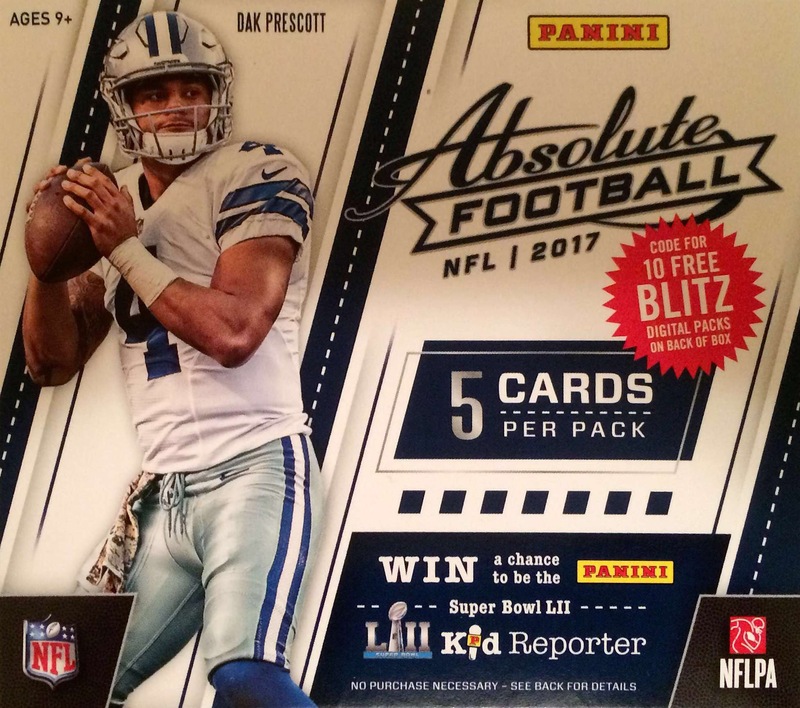 2017 Panini Absolute Football — Nice! 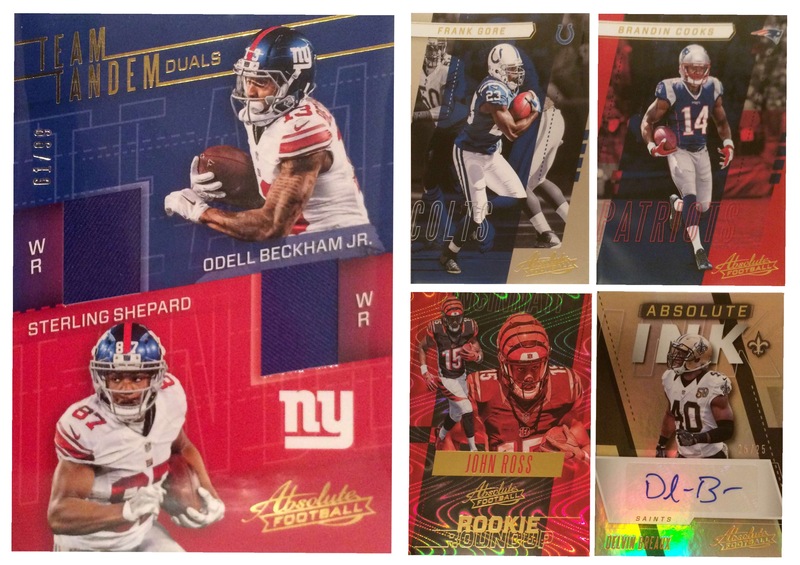 Overall, I really like the 2017 Panini Absolute Football cards! So far I’ve tried Absolute five different ways. Craziness but I like this set a lot! First, I got one of the three mini boxes from a hobby box (so a 5 card pack around $50 at the LCS). It contained a dual teammates relic (OBJ and Shepard), random auto # 25 /25 (Delvin Breaux, love that name bro :), a rookie insert (John Ross from UW! ), and two base. 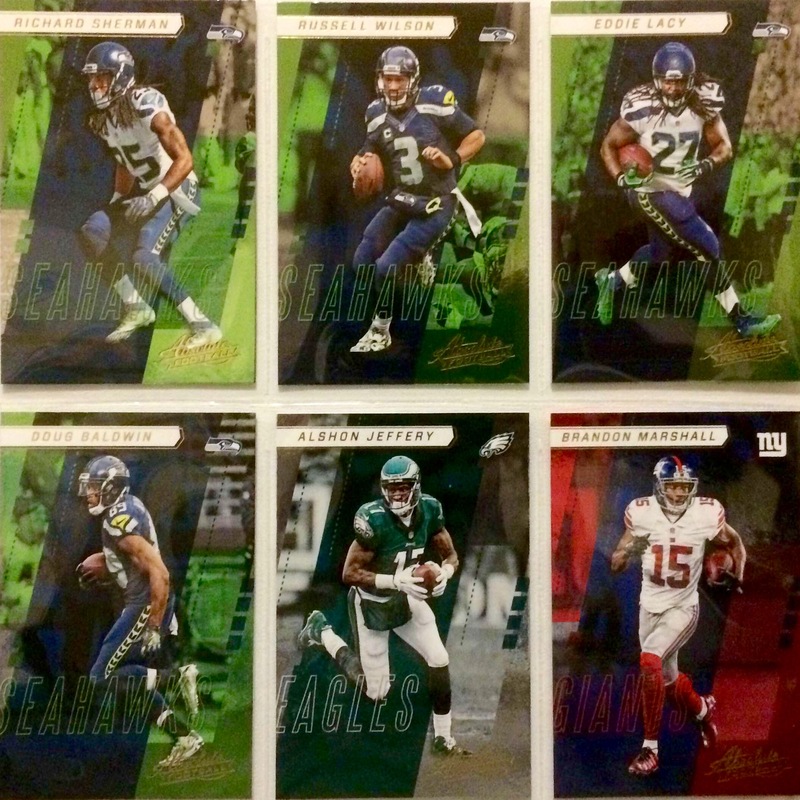 My second and most fruitful approach was a full case (hobby) break with 3 different teams, the Seahawks on one case, and both the Giants and Eagles on another. Had to bid on each team individually, and it totaled a little over $100. I got some really nice veteran relics, some rookie autos, interesting old school autos, low # parallels, and some base. 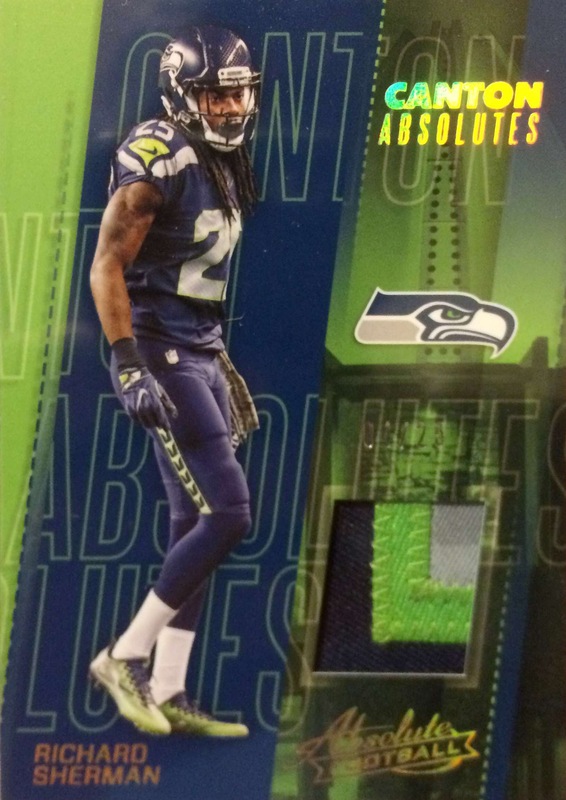 My favorite card from the breaks, and the only major Seahawks hit, was a Richard Sherman three color jersey card # 4 /25! Looks like a piece of a number from the “college navy” blue jerseys. Picture is a little out of focus but you get the idea. Awesome! From the Giants, got a couple of Y.A. Tittle autos, a Phil McConkey auto # 03 /25 (he was on one of those Giants’ Super Bowl teams in the 80’s). As far as I’ve seen, the autos in Absolute are all on stickers. Also got a very nice Sterling Sherpard dual relic # 23 /99 (feels like a helmet piece with a patch from a jersey or a glove). From the Eagles, got a Carson Wentz purple parallel # 1 /5 (whoa! ), a Jordan Matthews dual relic # 24 /25 (looks like a number patch and, well, something else), and a Shelton Gibson rookie auto #13/25. Also got some base cards through these breaks (doubles not shown). Finally, I kept going (why??? lol) and got four of the retail deluxe boxes (40 cards each, $39.99 + tax). One small relic and one auto each, all decent rookies. A fair number of inserts but only four packs per box so very heavy on base (as stated on the package). Not that bad but not worth the cost in my opinion. Of course, I wasn’t really done! As a crazy person (lol), I’d like to complete the base set 1-100 via trading or buying. So… I got a single retail pack, $2.99 +tax for ten cards. Actually got 6 of the 24 base cards that I was looking for and that ninth Rookie Roundup insert that I wanted! Also got three doubles. Nice pack 🙂 I have many many doubles triples quadruples etc. so I’m hoping to trade for the remaining 18 base cards. Overall I really like Absolute. As far as I can tell, the hobby and retail inserts are very similar (perhaps with variance in colors on parallels, odds per pack, etc.). However, the autos and relic cards I’ve seen in the hobby boxes are far superior, with a wider array of styles, veterans mixed in with the rookies, more low # cards, and much nicer relic pieces. I think the difference in “quality” between the hobby and retail boxes is very significant in this release, and would recommend a case break, hobby box, or singles on eBay. I give 2017 Absolute Football 4 out of 5 stars. Author vbsportscardsPosted on September 27, 2017 September 27, 2017 Categories FootballLeave a comment on 2017 Panini Absolute Football — Nice! 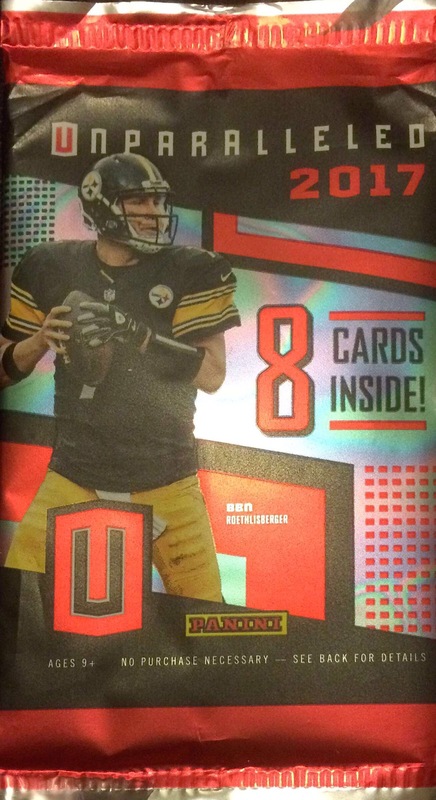 2017 Panini Unparalleled Football — New and Improved! Last year, I raved about Panini Unparalleled and how it grew on me. I have to say I like this year’s release even better! The set returns with a huge (unparalleled, in fact) variety of parallels and inserts. The main improvement is that the base cards just look better. The darker background just looks better to me than the brown or whatever it was last year. The two images below should give you an idea. A typical hobby box contains 8 cards per pack (3 Parallels, 2 Rookies, 2 Base Cards, and 1 Insert) with 8 packs per box (including 2 autos and 1 relic). So far, rather than just getting a hobby box for around $90, I bought a couple of hobby packs at my LCS and a bunch of cards on eBay totaling a little over $50. 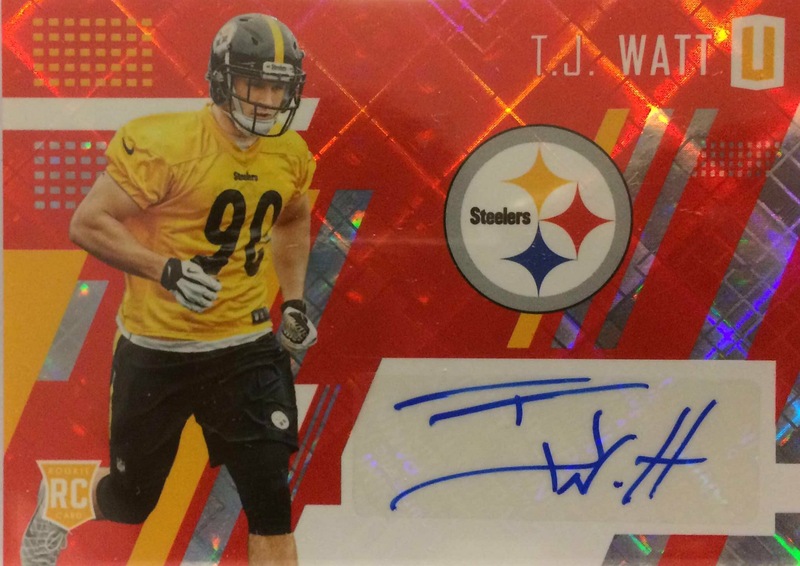 In my first hobby pack, I pulled this T.J. Watt RC auto “Red Diamond Awe” parallel # 5 /15 . Awesome! 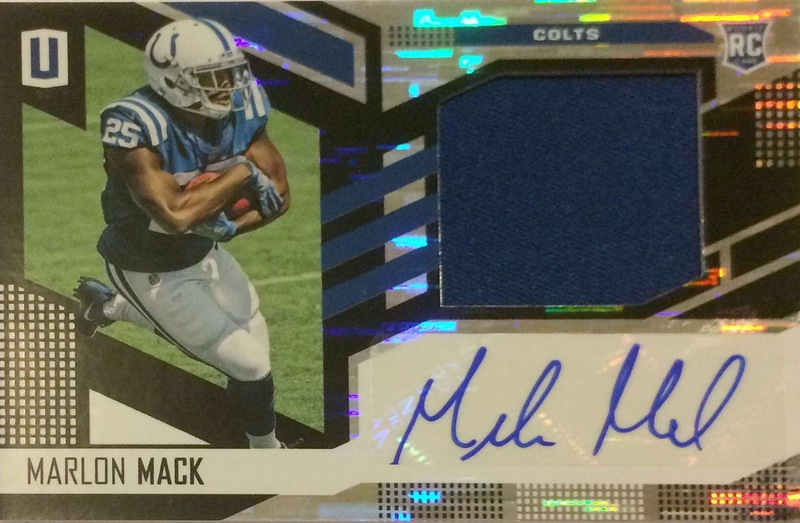 In my second pack, I pulled this Marlon Mack RC jersey autograph. Sweet! I picked up this insert on eBay. 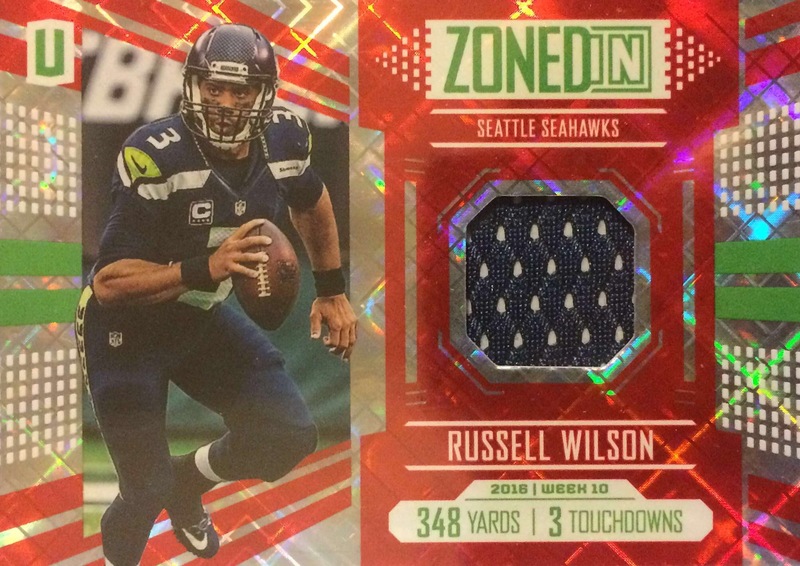 It’s my first Russell Wilson GU card, #20/25. Go Hawks! You may notice a “RC” for several veteran players throughout the set. I heard Panini wanted to recognize some players who were passed up in earlier years. Although I think that recognition is cool, I think labeling it an “RC” is corny at best. Otherwise I like the dazzling array of shapes and colors in Unparalleled, the improved look for the base cards, and fact that the boxes have more autos this time around. I’d give Unparalleled 4.5 out of 5 stars, I really like it! Author vbsportscardsPosted on September 27, 2017 September 27, 2017 Categories FootballLeave a comment on 2017 Panini Unparalleled Football — New and Improved! 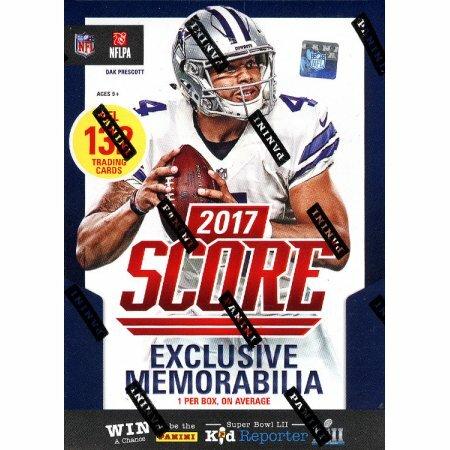 I recently picked up a blaster of 2017 Panini Score Football at Target (about $20 for 11 packs, 12 cards per pack, 132 cards, ~$0.15 per card). To be honest, I’ve been checking the shelves for several weeks and finally saw it. I really enjoyed putting together the 2016 Score base set and was excited to get a box! Upon first glance, my one word review was “eh,” nothing spectacular or particularly exciting, but nothing atrocious either. My two word review was “eh, ok”. Then it changed to “the cards are ok”. Next it was “the cards are ok — fun to collect and trade. :)” Finally, I settled on “Fun to collect and trade :)”. 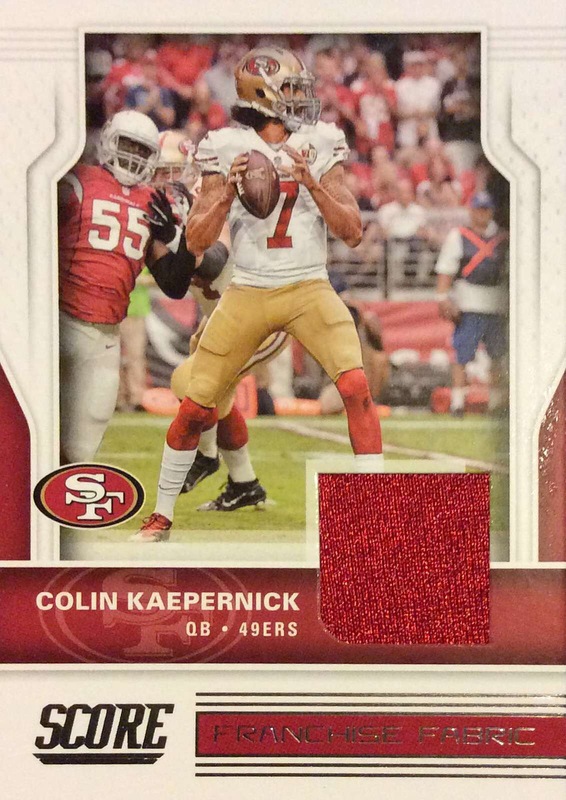 The first pack had a San Francisco 49ers Colin Kaepernick “Franchise Fabric” memorabilia card (red). Ironic because he is a free agent and no longer part of the Niners franchise. Anyway, as a Seahawks fan who always thought Russell Wilson was way better, he has not been a favorite player of mine. As an American, I have mixed feelings about his national anthem protests — I think people should stand and out there hands over their hearts for the anthem, but also think that individuals should be allowed to choose what they do as long as they are not disrupting the ceremony. However, as an American, I do appreciate his willingness to speak up publicly and provocatively about important issues and his social activism. Plus if the Seahawks end up signing him as a backup, I’d be more of a fan. So an interesting card right off the bat. Score has a plethora of inserts. My favorites are Color Rush, Fantasy Stars, No Fly Zone, and Signal Callers. There were three retail-exclusive gold parallels (although I like the David Carr parallel below, the golds are not particularly inspiring) and one Scorecard parallel, which is kind of cool. I didn’t see any #’d cards in my box. 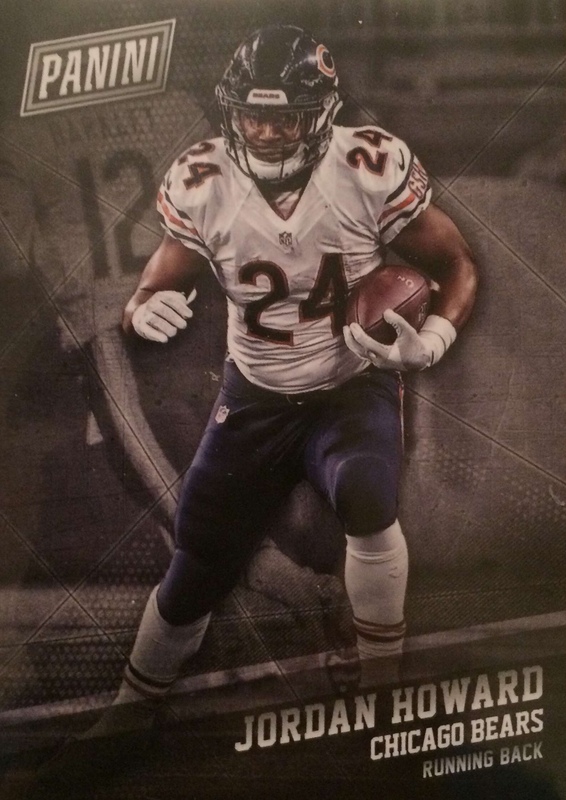 To me, the base cards look extra boring this year. That being said, I do like how Score has a wide number of both offensive and defensive players from each team in the 330 base veterans. (I don’t see any kickers or punters.). This set comes out in late April, so a fair number of vets are pictured with their old teams. I like that the RC’s are with the college teams because there will be plenty of cards with their pro teams later in the year. While being nothing special to the point of bordering on boring, 2017 Score is also an affordable and fun set with tons of players, inserts, and lots of collection options. I’ll at least go for Seahawks, former Cal Bears, and players on my fantasy team. Will probably also purchase a few select autos. Overall I’d give it 3 out of 5 stars. 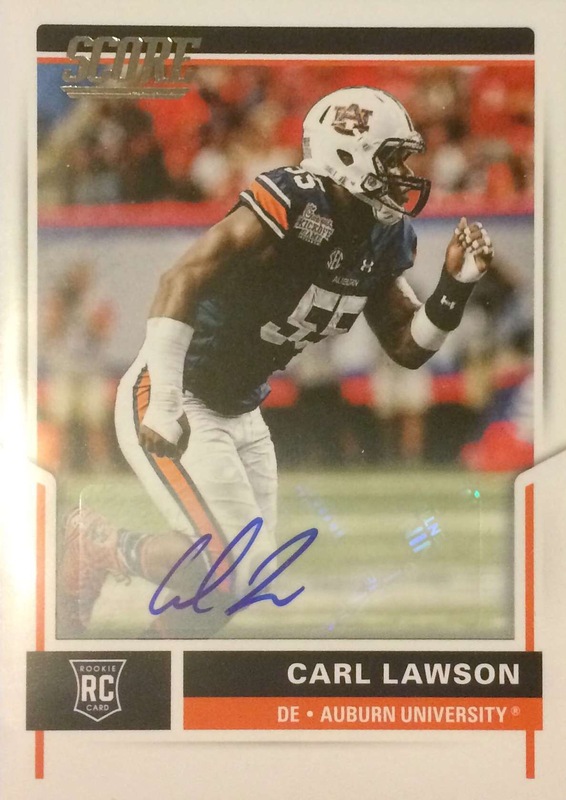 Everyone that I’ve heard from misses Topps football cards, including myself. Platinum was a pretty cool release — flashy cards without being overly cluttered. This is a nice card and it looks like a gold parallel. I’d trade it — dude went to Stanford lol. He was money on my fantasy team one year when he was on the Arizona Cardinals. He’s bounced around. This card is with the Niners and now he’s with Detroit. I got a couple of free packs of 2016 Panini Classics and I don’t like them, in case you were wondering. 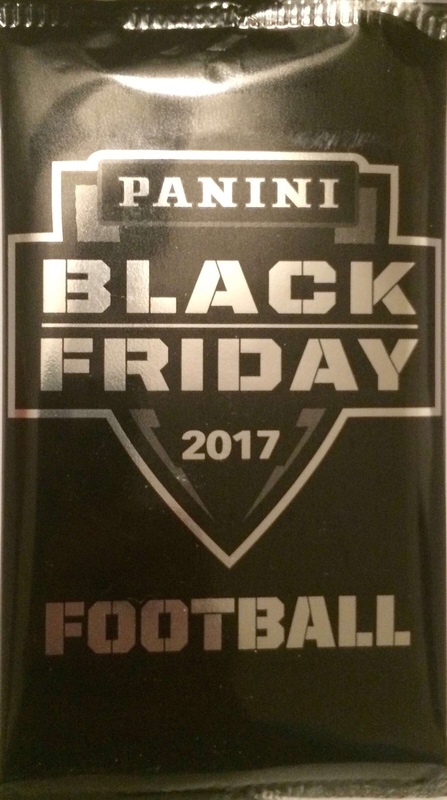 2016 Panini Clear Vision Football — Wow!!! 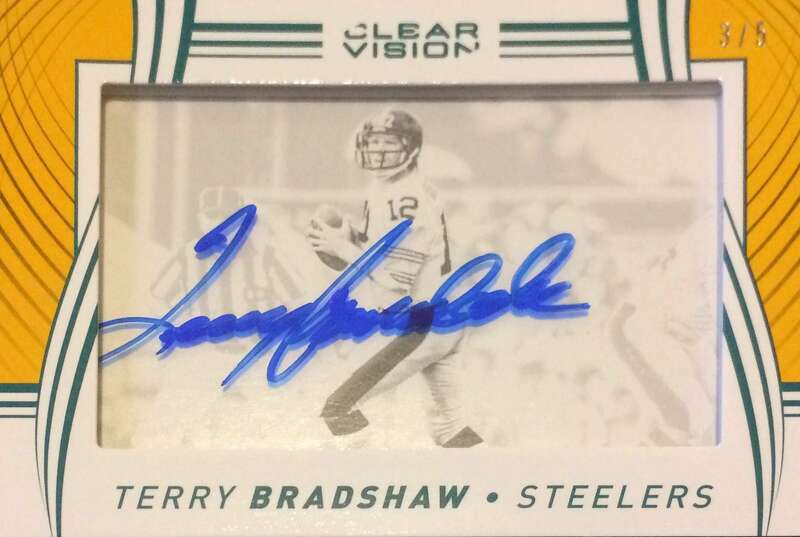 I mean, what can I say after pulling this #3/5 Terry Bradshaw auto in the first pack? (Signed on the acetate part of the card.) Actually, I couldn’t say anything when I pulled the card and my jaw dropped, but now I can say, “Wow!! 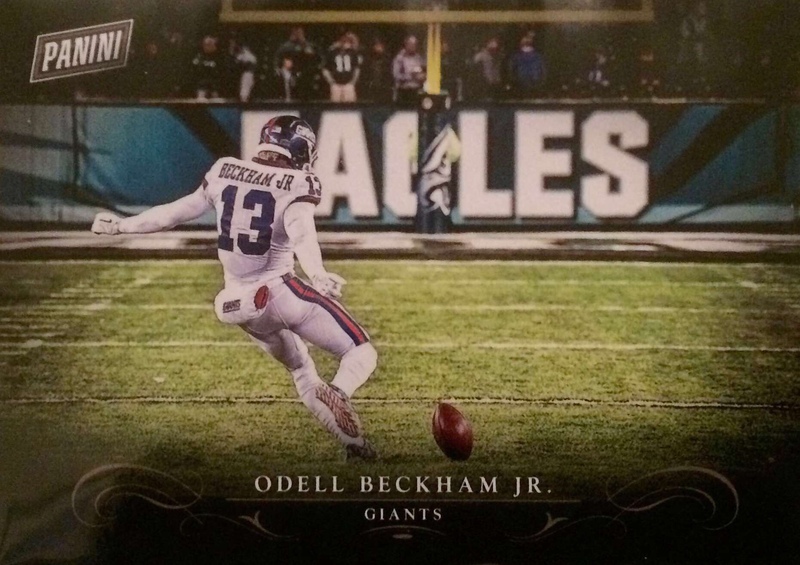 !” The rest of the cards in the 2016 Panini Football Clear Vision box are great too. (It’s six packs with three cards each.). There is one standard background for the vets, and one for the rookies. Both backgrounds allow for emphasis on the player and the clear acetate parts of the cards without distracting me. The cards are thin enough to avoid unnecessary bulk, yet thick enough to be sufficiently sturdy. There were a couple of nice numbered inserts (including A.J. Green and OBJ). It also seems that certain teams get emphasized in most Panini box, and this one had a nice Seahawks and Steelers emphasis. It included a Richard Sherman and Darrelle Revis insert, Sherman base, Jarran Reed rookie, Hines Ward base, Le’Veon Bell base, and the Bradshaw #’d auto. Great box with very nice cards! Author vbsportscardsPosted on December 3, 2016 December 6, 2016 Categories FootballLeave a comment on 2016 Panini Clear Vision Football — Wow!! !